In an era when compactness and portability seem to rule, this beautiful piece of photographic technology boldly proclaims a distinctly counter-cultural value. It’s big, it’s heavy and it’s loud! Fortunately cameras aren’t like cars so there isn’t any ethical obligation to forgo this sort of “bigger is better” approach to photography. The Pentax 67 is an absolute joy to use and there are many very accomplished photographers who continue to make superb images with this camera. 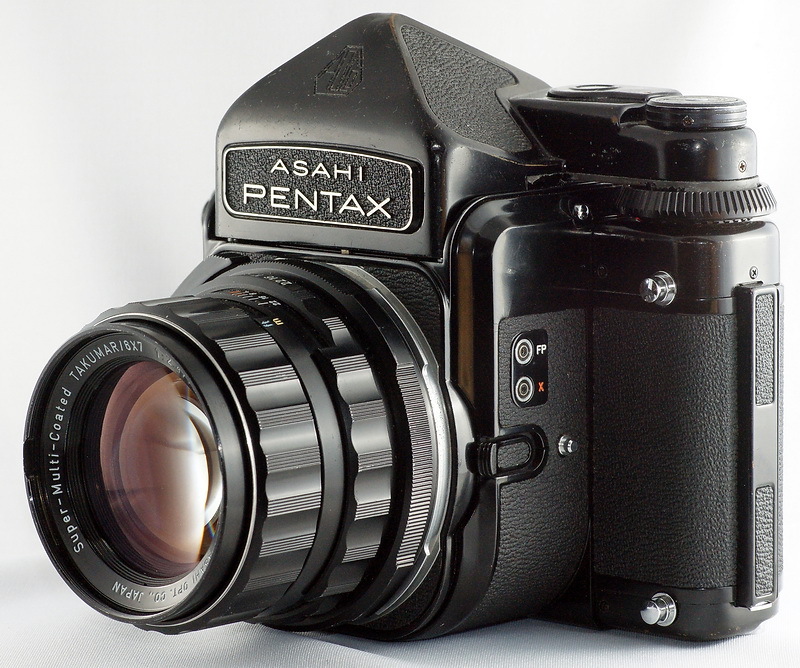 Asahi Pentax first released the 6×7 camera in 1969 and soon afterwards added the MLU function without changing the model name. That camera had an incredibly long run of twenty years before the slightly upgraded 67 was released in 1989. Then in 1998 it was completely redesigned and released as the 67ii and continued in production until 2009 when they quit manufacturing medium format film cameras altogether. Here are some good reviews of the camera that I’ve enjoyed. 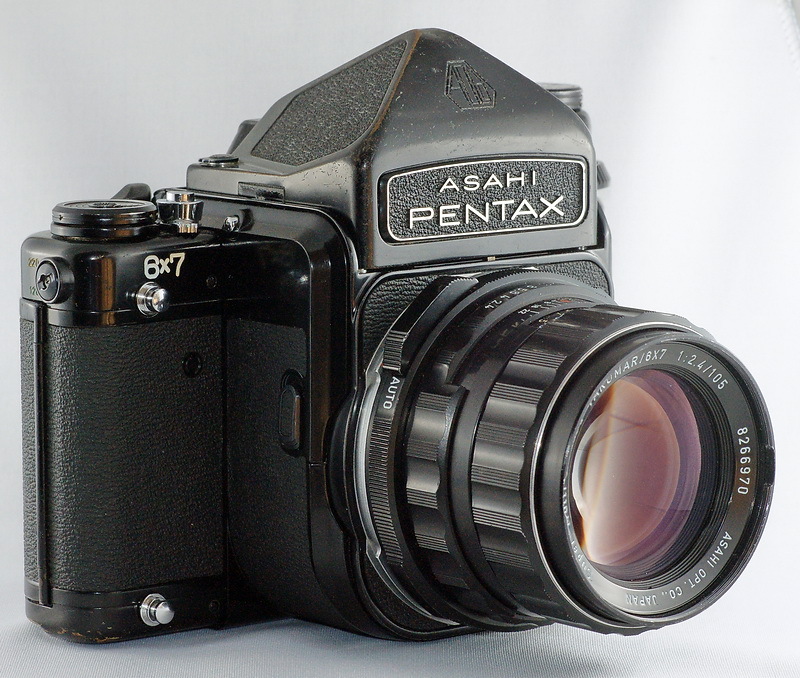 This medium format film camera was my first 6×7 body and what makes it unique is the extent to which it resembles a normal 35mm SLR; just a lot bigger. It is not ideal for handheld photography although some photographers get great results anyway, but is very simple and straightforward to use on a tripod. The shutter is a focal plane shutter so using the mirror up function is pretty much essential. I got this camera with the standard 105/2.4 lens for right around $100. Over time I gradually added the other lenses but none of them were more than $100 either, and some were less than $50. I also got the TTL metered finder for about $35. Here are some photos taken with these cameras. The original line of lenses for this camera are labeled “Super-Multi-Coated Takumar” and have all metal focus rings and grips. The later SMC Pentax lenses have rubber grips on the rings. do you know what are the main differences between 6×7 model and regular 67? also, is TTL metered prism a coupled prism (meaning I can control the shutter speeds on body via prism setting)? Hey NJS, thanks for taking the time to visit my site. By the way, did you see the shots I posted today at APUG taken with my 80/1.9? It was my first time to actually use the lens and I was pleasantly surprised, especially after seeing your sample. Anyway, about the 6×7 vs. 67, at first glance the bodies appear to be identical. It is very difficult to find any differences. But at Photoethnography.com’s Classic Camera DB I found the following description. As for the TTL metered prism, there are no electronic controls other than the on/off switch. But as you can see from the photos above, the finder is mechanically coupled with the shutter speed dial. And there is a large ring that slides over the dial before you attach the finder. Otherwise the dial is very hard to reach. The ring just makes it larger so it sticks out and can be spun easily with your thumb. So when you turn the finder on you see a needle and you manually adjust aperture or shutter speed until the needle is in the right place. Just make sure you take the lens off the camera when attaching the TTL finder or else you can easily break the linkage chain. Eric at pentaxs.com is really good but he is in the US. yeah, I saw those samples but I am not that experienced to know the reasons for that last frame and the part on that frame that looks underexposed. 80/1.9 is definitely a strange fruit, as you may have already seen here: http://www.flickr.com/photos/overdear/tags/8019/ – sometimes the bokeh is nice, sometimes acceptable and on few occasions it looked gorgeous, I don’t know what’s the reason for that, perhaps different focus distance pronounce different characters in background rendering from that lens. Thanks a lot for the info on P6X7, that’s exactly the info that I really needed to learn – I saw one Pentax 6X7 with TTL prism attached going for $150 in my hometown so I was tempted to pick it up, but the seller’s not that much reputable so I’m not yet sure about it, I wouldn’t be surprised it’s completely broken. Also, it doesn’t come with any lens and 90/2.8 that I’d like to shoot with is almost impossible to find here, not to mention UW lenses such as 45mm or 55mm Takumars. As for the 6×7, $150 would be a good price if it was working. But there are several things to check. Light seals are often bad but easy to replace. Make sure the chain isn’t broken. Also obvious stuff like shutter and mirror, and focusing screen. But also the TTL meters can go bad so make sure it’s accurate or at least close and consistent enough. To check the shutter you need a battery. Then open the back and then press down on the film counter and rotate it to any number beyond 1 and while holding it there, close the back. Then you can dry fire it as much as you like. To dry fire with the back open you need to wedge something into a little spot on the take up reel. Pentax actually made a little tool for that, but its kind of complicated. And when attaching or removing the TTL finder do it with the lens detached (especially when attaching the finder). Here in Tokyo the older T lenses are usually under $100 except for special ones like the 300mm, the WA and the zoom. The newer P lenses are usually more. Just wondering if I had one of these and a number of lenses for sale in very good condition what they would be worth today? It’s hard to say Collie, but the 6×7 bodies usually go for $150 to $300 here; a bit less if it is the early model without the MLU function. If it is a 67 body it will probably be more like $200 to $450. Of course, if you have the 67II it goes for a lot more… definitely over $500, maybe closer to $1,000. Also it depends on which finder you have; the metered eye level prism finder is worth the most. Finally, lens prices vary greatly as well. P series lenses are probably twice as valuable as T series. Many of the more common T series lenses like the 75mm, 105mm, 135mm macro, 150mm and 200mm are usually under $100 but wide angle extra long lenses go for more. I added the 300/4. Not sure if I’ll ever use anything this long with the 67 but it was too cheap to pass up! Can you tell me what battery the Asahi Pentax 6×7 takes please? My battery light is working, but I can’t seem to be able to take a picture. Thanks so much! The 6×7 and the 67 take the smaller 6V PX28/4LR44 battery. The newer 67ii takes two slightly larger CR123A batteries. Can you recommend a good tripod for the Pentax 6×7 system that isn’t crazy expensive? I only buy used tripods. Depending on your needs, the prices can be very reasonable. If you intend to carry the tripod long distances, up mountains etc. you’ll have to spend more money on a carbon one. But if you don’t need it to be lightweight, old, heavy and very sturdy tripods can be had for next to nothing.